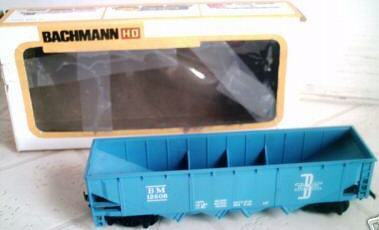 Part of the HO-scale freight car introduction was Bachmann's 42' Quad Hopper model and this Boston & Maine example. Notice that early '70s packaging included a foam insert that held the car in the window display box. The foam inserts would be replaced by cardboard by the mid 1970s. Though this black B&M hopper is not listed after its 1973 catalog appearance, it may have still been available from Bachmann. Beginning with the '74 catalog, Bachmann stops listing specific roadnames for its freight cars. Often Canadian roadname examples are not found in catalogs, but the Bachmann CP Rail 42' Quad Hopper is among the group pictured in 1976. That appearance is the only time the CP Rail hopper is included in Bachmann's Rolling Stock section of the catalog. The '76 price was $3 for this car. There are at least two variations to Bachmann's application of paint for its D&H Hoppers. Above is the more elaborate of the two with a multi-colored D&H herald. This car was catalog by Bachmann in 1986 and again in 1987. The second example features only white Delware & Hudson lettering, this model was included in train sets in the late '80s and early '90s. Bachmann cataloged this Louisville and Nashville 42' Quad Hopper during the 1970s. The L&N carrying the road's "Dixie Line" slogan on its side was among the original freight car offerings in HO-scale from Bachmann in 1970. This car last appears in Bachmann's 1977 catalog. Bachmann's second L&N 42' Quad Hopper was decorated in blue with yellow lettering. This second L&N example was part of a collection of 18 freight cars introduced in the 1986 product catalog. That new group of 18 cars, included five new paint schemes for the Quad Hopper: D&H, L&N, Napierville, Ralston-Jefferson, and Morrison-Kundsen. By 1980, Bachmann's roster of 42' Quad Hopper models going by annual catalogs was a group of four that included this M&StL example. The other roadnames included Burlington Northern, Rock Island, and Union Pacific. The stock number 43-1006 was found beginning with the 1982 catalog; 1039 was used in '80 and '81. These stock numbers are listed for Bachmann's Assortment of 42' Quad Hoppers and do not reflect each individual model's number. Bachmann's product catalogs often labled this car's roadname as "Missouri & St. Louis," rather than the proper Minneapolis & St. Louis. 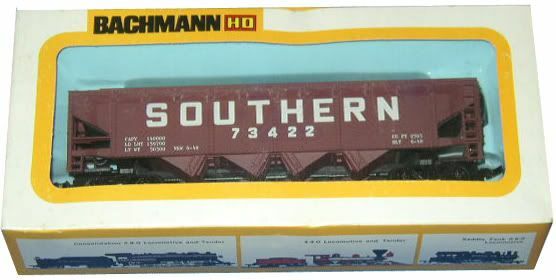 Beginning in the late '80s, Bachmann reduces the colors and/or amount of lettering found on certain items. The M&StL hopper may found during this minimalist period in a simplified lettering version, which may be seen directly below the first M&StL example above. This example of the 42' Open Quad Offest Hopper is dressed in The Rock blue, but does have some paint variations. The first example presented features multi-color printing of its graffics; the later is from the late-'80s/early-'90s period when Bachmann did some rather minimalist interpretations of railroad schemes. First seen in Bachmann's 1978 catalog is the yellow UP 42' Hopper with red lettering and the Be Specific slogan. This Union Pacific example, along with BN, The Rock, and MStL hoppers, would be found in Bachmann catalogs into the '90s. From promotional train set offering made for Zenith in the 1980s. Bachmann's 42' Open Quad Offest Hopper is among the first group of HO-scale rolling stock offerings in the company's 1970 product catalog. One new roadname, CP Rail, is added to the Hopper's line in 1972. The suggested retail price in '72 is $2.50 according to the Bachmann catalog. Bachmann's 1976 catalog presents four roadnames for the 42' Hopper: CP Rail, Lehigh Valley, L&N, and MKT. The car sells for $3.00 according to the 1976 Bachmann catalog.